On 12.12.13, BGB -10 and police attacked Islami Chhatra Shibir protesters in Nather Phetua Purana Bazar on the way to from Comilla to Lakhsmipur. 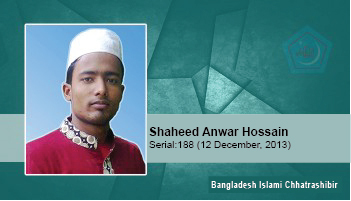 BGB shot directly and a bullet shot directly hit Shaheed Anwar Hossain. He was hit in the chest and fell to the ground. He passed away on th way to Sonaimuri Hospital at 6:40 pm at a place called Bipulashar.